Ivy Academy, a charter school in Hamilton County serving grades 6-12, this week held the grand opening of a new wing at its high school housing the Tennessee State Parks Environmental Institute. 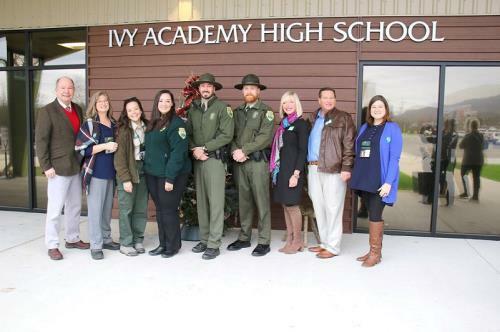 Ivy Academy is the first environmentally themed public school in Tennessee. The school partners with Tennessee State Parks for high school students to major in environmentally related fields. Instruction at the school allows students to move more outdoors than students in traditional educational settings. The school uses Tennessee State Parks rangers to help educate students. Students in grades 9-12 can major in studies that lead to careers in environmental work. The school offers majors in veterinary science, environmental audio/video production, and environmental natural resource management. Prior to entering high school, students at the school in the 6th grade Student Junior Ranger class have a curriculum adapted from the Tennessee State Parks Junior Ranger Program. Two part-time Tennessee State Parks resident-rangers are stationed on campus. They coordinate with instructors at Ivy Academy to schedule professionals as guests in Ivy Academy classrooms. The school uses the partnership to help students become part of a pipeline of talent in the environmental fields. All of the high school classrooms at the school are named for Tennessee State Parks. The school emphasizes college and career readiness as part of the Drive to 55 initiative in state government. The new facility is financed by the U.S. Department of Agriculture’s Office of Rural Development. Dignitaries including Tennessee State Parks officials were part of student-led tours and meetings on Tuesday that also included school staff, administrators and community members. Ivy Academy is at the headwaters of the North Chickamauga Creek Gorge in Soddy Daisy.